Long Island, New York -- Haitian-American Nassau County Legislator Carrie Solages was arrested Wednesday. Solages is accused of assaulting his girlfriend, police said. 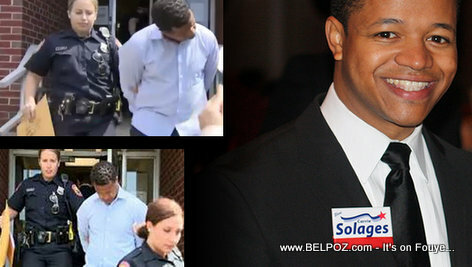 According to reports, Solages grabed his girlfriend by the neck and hit her against the wall in the presence of a child. Carrie Solages, who represents the 3rd Legislative District, faces third-degree assault and endangering the welfare of a child charges, according to police. « Haiti Security : Why is that most Haitian businesses DO NOT have security cameras? There are increasing calls for Nassau Legislator Carrie Solages to resign as new video has surfaced of an alleged domestic abuse incident. Solages was arrested on assault and child endangerment charges earlier this year. He pleaded not guilty and was re-elected last month with more than 70 percent of the vote. As News 12 reported Thursday, the cellphone videos were first posted on YouTube in September by a Haitian-American news and entertainment organization called Tele-Image. Thank you for presenting my comments. Other pages have censored my scripts about Nassau County's injustices towards Darryl Woody. His death was caught on video(s) that NUMC/ NCCC are hiding from the public. Carrie Solages has the "Right" to be treated fairly! He also has the "Right" to defend himself in a fair trial by a fair and un-bias jury. He has the "Right" to be free from Cruel and Un-usual Punishment if he's convicted on [domestic violence] charges. None of these protections were given to Darryl Woody who was arrested on (falsified) domestic violence charges on Dec. 24th [Christmas Eve] 2010. Carrie Solages, unlike Darryl Woody, was treated 'Civil' when he was arrested. Darryl Woody was abused, beaten and denied medical attention for the injuries he sustained while being interrogated by Williston Park detectives trying to force him to sign a false statement incriminating himself. Laura Curran's first priority should be directed at 'Boss' Ed- sticky-fingers -Managano's politically engineered health-care crisis at the jail that put NUMC's Tragic-Care back in charge of inmates medical. Before Armor Correctional Health, there was NUMC's Tragic-Care costing lives at NCCC. Nassau County knew about Armors numerous (pending lawsuits before hiring Armor. Nassau County [also] knows about the numerous lawsuits against NUMC. Nassau County's (federally indicted) leader Ed- sticky-fingers -Mangano has managed, with the aid of his crony appointed Sheriff, Michael J.Spasato, has bamboozled Nassau County tax-payers taking the county backwards to the future with his enterprise corrupt agenda that puts lives at the jail in peril_inmates be damed! 'Boss' Mangano's continuing criminal enterprise scheme, while under federal indictment for racketeering and bribery charges, has not stopped him from defrauding his constituents in Nassau County. Stop The Press! Norma Gonslves has conspired with NCCC and NUMC to violate Darryl Woody's Civill Rights to Due Process. Norma Gonsalves as a presiding member of the Jails Advisory Board that oversees NCCC in 2011 failed to hold NCCC and NUMC accountable or transparent in the January 3, 2011 death of Darryl Woody. Darryl Woody's death on January 3, 2011, while on 1to1 Suicide Supervision at NUMC's Secure prison Wing for prisoners at the jail, is a homicide covered-up to look like a [Suicide by hanging], Darryl Woody's death was death was caught on Video Surveillance Cameras at NUMC and at NCCC. Nassau County is hiding the truth about Darryl Woody's death by asphyxiation. Long Island, New York - Carrie Solages, le législateur Haïtien-Américain de Nassau County, a été arrêté mercredi. Solages est accusé d'avoir agressé sa petite amie, a déclaré la police. Selon les rapports, Solages a saisi sa petite amie par le cou et l'a frappé contre le mur en présence d'un enfant. Haitian-American millennials, how much of the money you earn is NOT being spent on debt?